You might have noticed we’re in a crazy news cycle right now, and in these times of political and civil uncertainty, staying on top of breaking news is more important than ever. If you want the most relevant stories delivered to your phone in the shortest possible time, we’ve got the apps for you. You can pick up news apps of all shapes and sizes for Android and iOS, but here we’ve tried to focus on the candidates that excel in one particular area: breaking news. That means push notifications that surface the stories most relevant to your interests, and delivered as fast as possible. The number of alerts you get varies depending on how you configure each app, but having carried these apps around for a couple of days, both AP Mobile and News360 are the most consistent for throwing up news stories that are just breaking, with the AP app best for local news stories (if you’ve set local news stories up). Each of these apps has their merits though, so we’d recommend trying out a few to see which ones work best for your news taste. 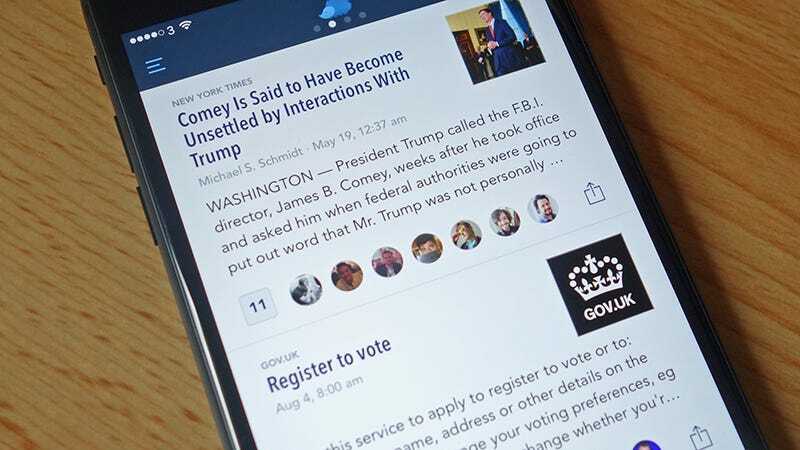 Nuzzel scans what your friends on Twitter and Facebook are sharing and uses that as an indicator of what news you might want to hear about. The app’s ability to filter news headlines based on their timeliness as well as their popularity on your social graph is handy. in general, Nuzzel doesn’t show alerts for as many stories as other apps, but when something big is breaking on Facebook or Twitter, it seems to do the best job at showing the news first. Indeed, the app’s breaking news alerts consistently impressed us with their speed and relevance. Additionally, you can customize the threshold used to trigger a breaking news alert as well as limit the number of push notifications you get a day in the app settings. You can turn on push notifications for news (and traffic updates and the weather) from inside the app settings, and we’ve seen numerous timely headlines appear while we’ve been using the Google Now launcher that comes on stock Nexus phones. It’s less aggressive on iOS, but you can still configure push alerts on the news you want. Everyone’s favorite mobile magazine maker is also useful for breaking news alerts too, and you can either tap into the shared knowledge of your social media feeds or rely on Flipboard to ping you regularly based on the topics of your choosing. The app was recently redesigned so flicking through your curated stories works more smoothly than ever. You don’t get all that much control over which stories prompt alerts and how often they come through, but there’s an impressive level of customization when it comes to the topics that Flipboard pulls together for you, and a host of news sources to pore through. When you’re ready to read something, the interface is hard to beat. A lot of news outlets pull their stories from the Associated Press wire anyway, so why not go straight to the source? The new organization’s app design won’t win any beauty contests, but when it comes to getting notifications relevant to your interests, the AP is killer. AP Mobile doesn’t tap into your social feeds and doesn’t even require any kind of registration, so it’s a more straight-up take on the day’s news, sorted into the categories or the parts of the world you specify. Inside the app settings you can set up a ‘quiet time’ when you won’t be buzzed by whatever breaking news story is about to hit the headlines. One of the more venerable news apps out there, News360 has been treading the beat for a while now, but still comes up with the goods if you’re after fresh, relevant news headlines pushed straight to your phone. It’s one of the best at sifting the genuinely important stories from the rest, and you can go pretty specific in terms of news topics. News alerts can be switched on or off for certain categories, if you want push notifications on tech news but not sports scores, and there is the option to link your Facebook and Twitter for a more personalized feed, though this isn’t essential. You can like or dislike stories you read too, which means News360 learns more about what you want over time. Squid is worth checking out for the way it blends standard features like topic selection with more innovative touches, including the option to annotate articles with text and scribbles before sharing them with your contacts. The special reader mode for articles is friendly on the eyes too. You don’t get much control over the push notifications the app sends out, so you’re relying on the curation you’ve already done inside the app in terms of sources, but we found Squid did a decent job at keeping us up to date with happenings across the world.